Home › frugal › must read › BillShark Review - Scam Or Really Lower Your Bills? BillShark Review - Scam Or Really Lower Your Bills? I first learned about Billshark while talking with a close friend of mine. After searching to the ends of the web and finding little to nothing I decided it was time to personally investigate this company and share with you guys what I found out. I know the Living Cheaply crew are always looking to save money. 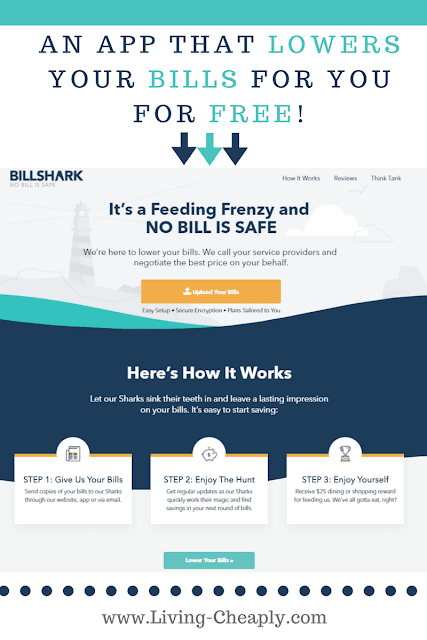 BillShark claims you can lower your bills with them in under 2 minutes with as much as 25% savings on your bills each month. The make an impressive claim that their sharks have an 85% success rate negotiating bills for their customers. The process is fairly easy and if you can download the app and send your bills to them you are good to go. What they do exactly is negotiate with your Cable or Satelite provider, Internet provider, home security provider, and satellite radio provider, etc. Ultimately what they promise is to save you the time and hassle of arguing with your providers yourself while at the same time doing the best job possible doing so and maybe getting your bills lower than you could. I do not believe they have any power to get anything do that you could not for yourself. But we must remember this is what they do and they do not get paid if they do not manage your bills. So I am sure they may know a few tricks that some of us may not be aware of. 1. Take a PICTURE of your BILLS using their app. 2. Send the picture BillShark. 3. Relax while you wait for them to attempt to negotiate your bills down for you. They have an Android and iPhone app. You also can scan and upload online via their website as well. 2. money on your bills. 3. They do not store your credit card information. 4. They promise not to share your personal information. They may not save you a dime on your bills. Well actually no! This site is legit and has been helping its users lower their bills for years now. However, that does not automatically mean they will lower your bill for you. Sometimes they can not do anything to help you out. Also, if they do lower your bills you must split the savings with them for the first 12 months ouch! Still half of anything is better than nothing right. What I would do before trying Billshark is call your providers yourself and try to see what you can do yourself first. That way whatever this company saves you will clearly be a bonus. So splitting the savings shouldn't be an issue at that point. However, if you just do not want or have the time to make the calls yourself just go ahead and let Billshark do it for you. What do you have to lose at that point? ➤➤ Join Here And Get a $10 Bonus Off your Bills! I've tried it myself, they couldn't do anything on my Cable bill. But they have solid customer service and I'm sure they might be able to help some others. I've been trying different things like saving money on my Home and Cell Phone service and other similar cost-cutting services as I've been looking to save as much as possible lately. Living Cheaply would love to hear about your experience with BillShark in the comments below.